- 2 batteries: The second powers the water pump for the sink and toilet (yep, there's a toilet ... in the comfort of your very own closet) as well as the lighting inside- which there is plenty of. I purchased her in April 2018 and prior to fully living in it, there was a lot of work done both mechanically and to the interior. 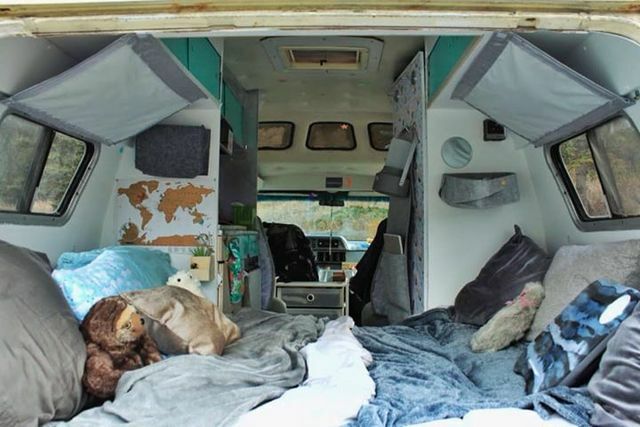 Virtually everything on the inside is freshly painted with new fabric, accessories, and laminate flooring - said goodbye to the shag carpet for good reasons. She was fully inspected by Whistler Auto in June 2018 and again by Grizzly Auto in November 2018 with diagnostic reports and as of April 2019, all minor issues resolved. She runs like a dream and other than replacing the tires, adjusting the alignment and wheel bearings, I never encountered a serious issue whilst owning this vehicle. * The speedometer and odometer haven't worked since I've owned the van. I use the Waze app whilst driving so I can gage my speed. * There is a propane system for the furnace under bed and fridge, however I haven't used either of these things since I've owned the van. According to the previous owner, it does work.